I had a bit of trouble with the Tail Roll Pin (106-910). After pushing in one side, the other side did not line up. I ended up using a small screwdriver to push the misaligned end of the roll pin into place. A. Drill a hole through the torque tube and a dimple into the Coupler to better secure the set screw. B. Drill a hole through the Collar and Coupler. Insert a roll pin through both to secure. Realraptors explains it nicely here. C. Add some green loctite or CA to the coupler. The setscrews securing the front bevel gear (115-210) to the trans output shaft (115-211) had loosened up a bit causing some slop in the tail. Tighten them up to remove the excessive play. Also checking the screws in the rear TT coupler (115-221, there's an inspection hole in the boom) and the front coupler housing (115-213). 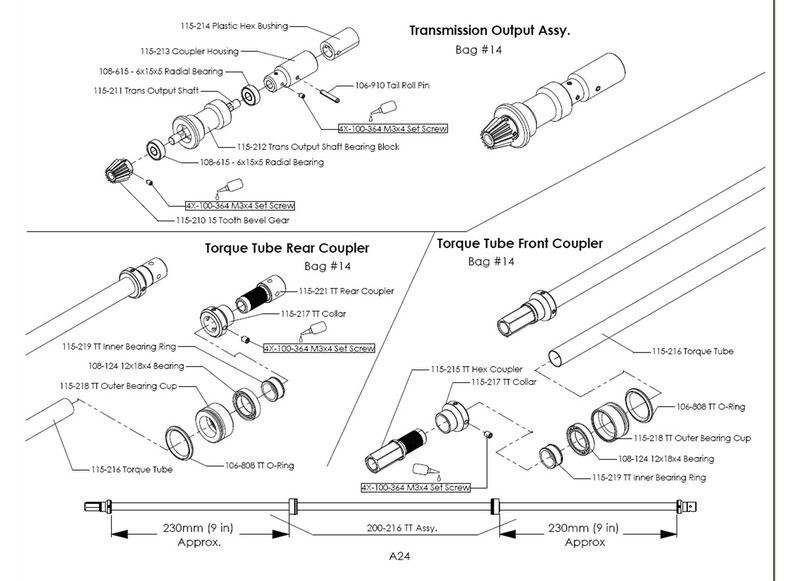 A correct torque tube assembly is critical in order to prevent failures due to building error. It is imperative that all set screws are tight enough to engage the aluminum tube with the spline on the torque tube ends. Make sure and use blue thread lock on all set screws to prevent them from backing out. A tight fit of the bearing house o-ring to the tail boom is critical to prevent the housing from spinning within the boom. Insert the torque tube into the tail boom can be a little difficult due to the tight fit. Possible lubricants to help include lithium grease, alcohol, and liquid detergent. Make sure you use just a little.